Using Mid/side Stereo Image Modifier you can freely change the sense of space, in 4 different frequency-ranges. Mid/Side mode optimalizes the audio sign. The pan controls are used to position a channel between the left and right side of the stereo spectrum. You can change the volume or stereo image with the delay function. Reverb function gives different reverbs to the 4 frequency-ranges. Graphic frequency range handler interface: It can manage 4 different frequency ranges. The overlay of the different ranges can be changed with the vertical white lines. The ranges are colour-coded. When used, the vectorscope shows the stereo images of the ranges, and therefore you can see on the graphic display if the sense of space is correct. The colour coded scopes show the frequency-ranges' value one by one; the grey scope shows the sense of space of the whole material. Enhancer: Adds to the sense of space. In middle-state there is no change. Pushing the slider up the sign changes to mono, pushing it down adds to the sense of space. Mid volume: Changes the volume of the mid-channel Useful function, because it lowers the middle sounds’volume – like the kickdrum or the vocal zone. Delay mid: Gives space to the mid channel without changing the side channel. Pan mid: Moves the mid channel into stereo space, changing the stereo’s sense of space. No need to use it with well mixed music, but this function is available in all frequency ranges, and using them together results in an interesting audio. Pan side: Same as pan mid, but the change can be done on the side channel. Volume: All 4 frequency-ranges’ volume can be changed separately. Reverb room mid: Adding reverb to the mid channel, this function changes the release time of the reverb. Reverb room side: Adding reverb to the side channel, this function changes the release time of the reverb. Width mid: Changes the sense of space of the reverb belonging to the mid channel. At low-state the reverb is mono. Width side: Changes the sense of space of the reverb belonging to the side channel. At low-state the reverb is mono. 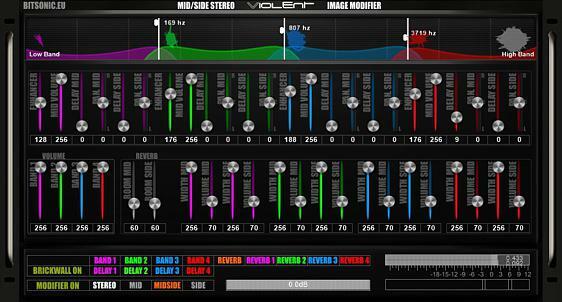 Volume mid: Changes the volume of the reverb belonging to the mid channel. Volume side: Changes the volume of the reverb belonging to the side channel. Stereo/mono button: Using mono mode you can check if there was sphase cancellation in the sign. Mid/side buttons: Using the buttons, you can decide whether you’d like to use the side or mid channel or both. Modifier on/off: In off mode the switch turns off all the effects in the program. Brickwall on: This function is turned off by default. In general, it’s advised that it’s not used, but if this is the eq at the end of the effect-chain, it might be needed to be used to avoid overdrive. It is important to note that this function’s side effect is that it’ll compress the sign somewhat. Using this function can be avoided if we use the slider for volume-adjusment and lower the volume until there’s no longer overdrive. Band buttons: These buttons are used to turn on and off the different frequency-ranges. When turned off, it turns off the whole stream of signs from the ranges – meaning that both effects and the original sign will be turned off. In this state the frequency-ranges’ interface can’t be seen, therefore it’s easy to tell which range is on or off. Delay buttons: Turns the frequency ranges on or off. Reverb buttons: The yellow switch turns off the whole reverb, the numbered buttons only turn it off in the given range. In demo version, all the functions can be used, but after reloading the project-file again, all settings will go back to default.